They did a swordfish set last night around midnight. We hauled in the set around 5:30am. We caught 4 blues and 2 makos. We also caught one pelagic ray. They set a shark line out around 7:45. We were hoping to be able to finish one last set before going into port. We were scheduled to be in port around 3. Teacher at Sea, Heather Diaz, holds up a Blue shark. Dr. Russ Vetter explained what the different computers are used for in the aft lab. There is one called at EK500/EQ50 which uses a split beam transponder to create a “map” of the ocean floor, so the scientists can use the data to find high spots, which sometimes are better for fishing. It also works as a sort of “fish finder” and the different things in the water show up in scale and color, so that you can see the approximate size of the animal/plant in the water. He also explained the Navigation computer, which digitally shows the charts (with soundings), topographical features (like islands and coastline), and our course. It also provides information on other vessels that are nearby, and when available, that vessel’s name and number…the same navigation computer they also use on the Bridge. The Nav. Comp. also provides information like our latitude and longitude and our speed. There is another computer which monitors wind speed and direction, temperature of the water (under the boat), barometric pressure, and salinity of the water. All of these are real-time, and provide important information to the scientists. There is also an ADCP (Acoustic Doppler Current Profiler) computer which displays a constantly changing graph of current velocity relative to the ref layer. The very last set of this leg was a bit slower than most, which may have been a good thing, since most people were starting to get a bit tired. We had 2 blues and 2 makos. We were very pleased to find out that we had, during the entire leg, managed to capture 80 blue sharks (78 were measured, sexed, and released), 63 mako sharks (61 were tagged and released), 23 pelagic rays (23 were released, none were tagged), 3 molas (3 were tagged and released), and 1 lancetfish (which was released but not tagged). Everyone seemed very pleased with the results, and now Dr. Suzy Kohin (Chief Scientist) and Dr. Heidi Dewar will head back to their lab at Southwest Fisheries to analyze the data. Last night the sky was very clear, so we were able to see a lot of stars, including the Milky Way, which was very easy to see last night. The view from the Flying Bridge (the very top of the ship) is amazing, and we felt like we could see every star in the universe, even though we know we couldn’t. We could also see the far away glow of Los Angeles, a reminder that we will soon be back in port and that our trip is nearly over. Nearby, there was a large tanker and a container ship, which also looked neat in the dark. The container ship was still nearby this morning when we woke up. The sunset this morning was amazing. There were a few wispy Cirrus clouds in the sky, which reflected the glow of the sun long before the sun made its first appearance in the sky. It was truly a beautiful sunrise, and a great way to start off our last day! This morning after the set, everyone was a bit disappointed that we have not caught a swordfish this trip. But, Dr. Heidi Dewar said she would consider doing another swordfish study in the future. Everyone is busy packing and getting their gear ready to go home. Everyone, including me, is excited to be going home to see family and friends, but I think most people will be a little sad, too. For me, this has been an absolutely amazing experience! I have learned so much, and I have seen more in the past week than I ever could have from reading books or watching documentaries. There is just something so special about being able to feed a sea lion, touch a shark, or come within inches of a mola to feel the power of nature and the beauty of the ocean. I am awe struck in so many ways. The people aboard the DAVID STARR JORDAN could not have been kinder, and everyone has gone far out of their way to make me feel like part of the DSJ family. Everyone from the captain and the officers, the boatswains, the stewards, and everyone in engineering has been friendly and helpful. I will surely miss everyone on board. As for the scientists, they did an outstanding job of helping me to learn things and to make me feel like I was a real part of their crew. I will miss the lapping of the waves, the rolling of the ship, the camaraderie, the food, the animals, the scenery, the sunsets, and the sunsets. And, although I cannot take any of them with me, I will have the memories of them all forever. I want to sincerely thank Lieutenant Commander Von Saunder, the amazing crew of the DAVID STARR JORDAN, Dr. Suzy Kohin, and her wonderful team of scientists for a fantastic experience! I never imagined it would be this incredible! I will be grateful to you all for a long, long, long time! Thank you for allowing me to share these past 10 days with you, and I wish you all safe travels and many more beautiful sunsets at sea to come! They did a swordfish set last night around midnight. We hauled in the set around 6am. We caught 4 makos, 9 blues, and 3 pelagic rays. One of the mako sharks that we caught during this set actually was brought up to the side of the ship and tied off with a leader rope. But, while we had him waiting at the back of the boat to be processed, he chewed through the monofilament line and disappeared. Another interesting thing about this set was that at some point during the night, our line was severed. We hauled in most of the line, but our flag was about ••• mile away from where the first part of the line ended. We steamed ahead and caught up with it, then hauled the flag over. João Alves, Lead Fisherman, was able to reattach the line so that we could use it again. We aren’t sure why the line was severed, but there were several boats in the area, so one of them may have run it over in the dark. We did our first shark set around 8am. We hauled in the set around noon. We caught 1 mako shark and 1 blue shark. We did our second shark set around 2pm. We hauled in the set around 6pm. We caught 3 mako sharks and 8 blue sharks. I asked permission to go to the Bridge, and there I met up with Commanding Officer (CO) Alexandra Von Saunder as she was beginning her watch. She has been an officer in the NOAA Corps for 14 years, and she has been a captain for the past year. The DAVID STARR JORDAN is the only ship for which she has been Captain. She actually resides in Seattle, but most of the year (sometimes up to 300 days out of 360 days) she spends most of her time at sea and away from the ship’s homeport. She said that the things that she loves best about being at sea are being able to see the sights (animals, sunsets, scenery) and the uniqueness of every day, since it is much more interesting than being at a desk all day. She said that the ship’s crew is like a family and that they are all very close, especially since they all eat together and spend most of the year together. I have observed while aboard the DSJ that everyone is very friendly and on a first name basis with each other. I have yet to see anyone who was unhappy with their job. Like Lieutenant Commander Von Saunder, everyone I have spoken with says they love being aboard the DAVID STARR JORDAN and that they would rather be here than on land. While on the bridge, CO Von Saunder also showed me all of the instruments and the charts that they use on the Bridge to run the ship. It was very interesting to see how they can monitor everything from that one room, even how much oil is in the engines! They have a neat computer system that plots where they are and radars that keep track of every other vessel in the area. Lead Electronics Technician Kim Belveal explained to me that even small sailboats show up on their computer, and if they have been registered, their boat registration number and even the boat’s name will come up on their computer. That way, if they need to hail the vessel, they can actually call them by name over the radio. There are also many cameras around the ship, so that safety and security can be monitored at all times. CO Von Saunder also showed me how they steer the ship, and control the speed. She said that the ship will go about 10 knots at its fastest, but that when we are setting or hauling lines, the ship is only going a few knots. She also said that the DAVID STARR JORDAN was launched in 1965, so it is due to be replaced in 2009. She wasn’t sure what the name of the new ship would be yet, but I can only hope it will be DAVID STARR JORDAN II. She said that a ship like this would probably be sold once it is retired, and that “She has a lot of life left in her.” It is clear that when Lieutenant Commander Von Saunder speaks about her ship and her crew, she is talking about her very own family. I also had the opportunity to speak with Junior Officer David Gothan. He is fairly new to the NOAA Corps, but he hopes to retire from the NOAA Corps in 20 years. He echoed Lieutenant Commander Von Saunder’s reasons for loving his work on the DSJ, as he said that what he enjoys the most about being at sea are seeing all the animals/scenery, meeting different people, and being able to go to different places all the time. 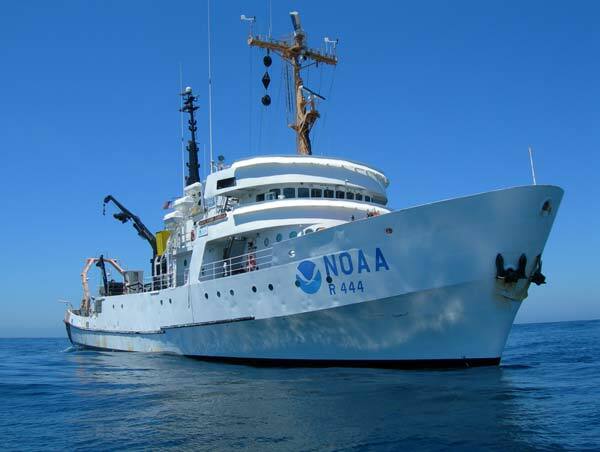 I get the impression that all of the NOAA officers on board truly love their job, and they are dedicated to being stewards of our oceans. I saw many different animals today, including dolphins and a few whales off in the distance. We also saw a few a sea lions who were basking in the sun. When they do this, they kind of lie on their back and stick their flippers up out of the water. They are so cute. One of them came quite close to our ship while we were de-baiting the second set, and people tried to throw him fish. We nicknamed him “Eddie”. He hung around for a while, but got bored and left the area after about 10 minutes. It was truly a pleasure to speak with Lieutenant Von Saunder, Ensign David Gothan, and Lead Electronics Technician Kim Belveal. And, I am excited to be able to share more of their insights about being a part of the NOAA Corps with my class! There was no swordfish, set done last night because of our excursion to Catalina Island. Instead, we set our first line (shark line) at 6am. We hauled in the line around 10am. We caught 10 makos, 4 blues, 1 lancetfish, 3 pelagic rays, and 2 molas. I had the opportunity to videotape the entire haul, which turned out to be one of our most productive. 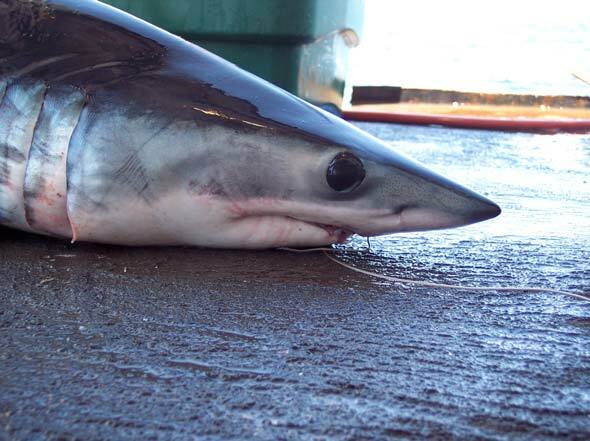 1 mako died today during the haul because it had swallowed the hook and most likely suffered an internal injury. He was measured, weighed, and dissected for further research. One of the makos we caught during this set was among the largest three we caught during this entire leg, and it was really interesting to see such a large shark, so close! We set our second line at around 12 noon. We hauled it in around 4pm. We caught 7 makos and 2 blues. Two of the makos we caught during this set were among the largest three we caught during this entire leg. This Mako shark didn’t survive being on the longline. The coloring of the shark is truly beautiful, and their skin is very smooth in one direction, and like sandpaper in the other. If you look closely, you can see little spots on his nose, which are actually part of his hunting and defense mechanism, and he is able to “detect” things in the water from a long way. Makos don’t have a protective “eyelid”, unlike Blue sharks. Karina and João have helped to preserve the jaw, and I cannot wait to show it to my students! With our first set, things started off right off the bat with several makos. Then, we got 2 humongous Sunfish (mola-mola)…and I mean they were huge! Then, we got a huge mako. He was almost 2 meters long. It was as long as the cradle itself! I couldn’t believe it. Everyone was super excited and at that point. During the whole commotion, one mako was pulled over the side nearly dead. We also had a lancet-fish which they hauled over the side while we were dealing with the monster mako in the cradle….and that was very much alive. It was flipping all over the place. Sean picked him up, took the hook out, and tossed it overboard. After we were all done and all the animals had been processed, we went over to look at the mako that they had brought on deck. Although the mako was near death, it appeared to be still breathing a little, though it might have been a lingering reflex reaction. After examining him on the deck, they weighed him and then started to dissect him. I have most of the dissection on tape. It was very interesting to see where all the internal organs are located and to see how their muscle tissue is designed. Dr. Heidi Dewar explained how they use their muscle tissue design to actually preserve body heat. It was really fascinating. I am excited to show my students her “lecture” on the muscles, and to share with them the dissection video, so that they can see what a shark looks like on the inside. I think they will enjoy it. During the second set, I was allowed to get down on the platform with the first two sharks…the first one, Dr. Suzy Kohin, Chief Scientist just explained everything. The second one, I was able to get in there and actually do the stuff! I collected the DNA sample of his dorsal fin…I put the tag in his dorsal fin…and, I gave him a shot of OTC in the ventral area. I also got to take its length measurement, which was freaky because I had to grab its tail and pull it straight. I don’t think the shark appreciated that much, and he squirmed a bit. He was also bleeding. Dr. Suzy Kohin, the Chief Scientist, said that he was bleeding a bit because he had swallowed the hook. I opted not to do the spaghetti tag (which involves shoving this metal tip into their skin) and I opted not to cut the hook out of its mouth,.…it just seemed really, really, really REAL…and I didn’t want to mess up and come out of it missing a hand or something…or worse, having unintentionally hurt the animal. Anyhow, I gave my kneepads over to Daniele who jumped in and finished the haul for me on the platform while I did the gangions. Which, turned out to be too bad, since we got some really huge makos on this haul…everyone was very excited about them. I think the largest was about 197cm. They put special tags in the really large makos, which they called a PAT (Pop-Up Archival Tag). They explained that these tags, which look more like turkey basters, are used to report data on temperature, depth, and even longitude so that they can better track the makos and learn more about their behaviors. They are especially looking for information about diving behaviors and their temperature and depth preferences. I would love to see what they find out from these fish! They also use a SPOT (Smart POsition and Temperature) tag. This is almost translucent and is bolted the dorsal fin (only on larger sharks). It looks a little like a computer mouse and is oval shaped. This tag sends radio signals to a satellite whenever the animal is near the surface, and they can use this information to track precisely where the animal is in the ocean. 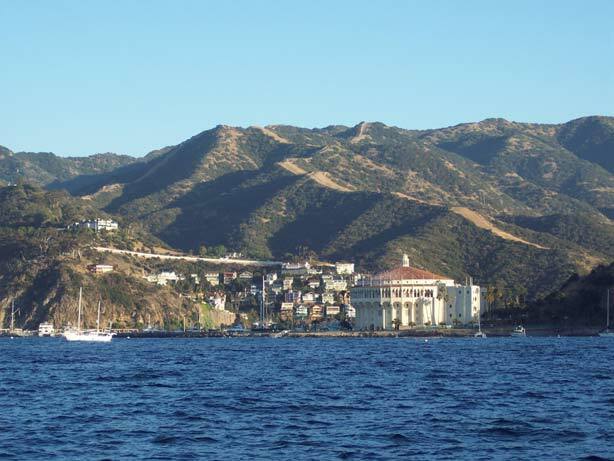 This is a view of Avalon on Santa Catalina Island, CA. They set a swordfish line at around midnight, and we hauled it in around 6am. We caught one blue shark and one pelagic ray. We then set the first shark set at around 8am. We hauled in the line around noon. We caught one blue shark and 6 mako sharks, though one of the makos escaped with the gangion, leader, and hook still attached. After that set, we headed for Santa Catalina Island where we would have liberty ashore. We were taken over to the port at Avalon by João Alves on the skiff, I went over with Natalie Spear, Karina De La Rosa-Mesa, and Chico Gomez. Everyone, except those on watch, was allowed to go ashore. Even the CO, Alexandra Von Saunder was able to make a quick visit to Avalon. Most people shopped and/or had dinner in a restaurant. A few people even went swimming at the beach! Everyone had to be back aboard the ship by 11pm. Karina De La Rosa-Mesa and I went back to the ship with Sean Suk and João Alves on the skiff at 9:45pm. Again, sea lions and dolphins were playing nearby today. I tried to get pictures/video of them, but it doesn’t come out well on tape. I love watching them…they are so graceful, and they really look like they are having a great time playing! One sad thing happened today during our sets…one shark got away. Someone dropped the leader line in the water and he took off. We can only hope that he is able to work the hook out on his own, soon. Everyone was very excited to be given liberty ashore tonight in Avalon. There are several people who have had the chance to come to Catalina before, so they are especially looking forward to this excursion. Catalina has changed so much since I was there 25 years ago! There are many more houses and condos now near the harbor. Though, the town and the touristy areas are pretty much the same. We enjoyed shopping and walking through the tiny streets. And, seeing the golf carts everywhere was very amusing. The Wrigley Mansion, which sits above the harbor is very beautiful, and many of the homes on the hill over the harbor are just fantastic. The moonrise was amazing, as it came over the hill…I think it was a full moon. Everyone in town seemed to be having a great time, and it was nice to be walking on land for a change (though, it did feel like the whole island was still moving with the rolling of the waves, even though I know it wasn’t!). I am looking forward to finding the pictures we took of the island when I was a child to compare them to today…I bet a lot has changed! 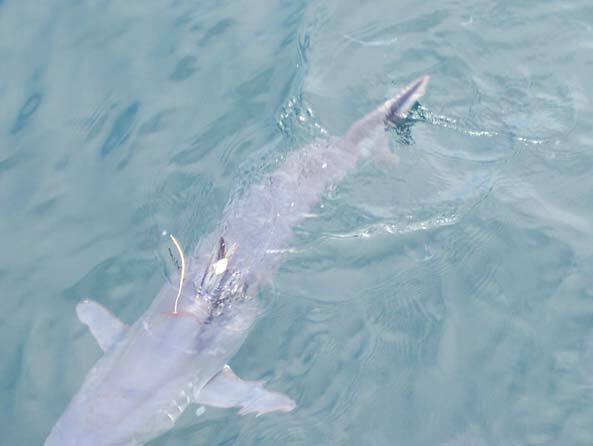 This is one of the Mako sharks that we tagged. You can see the “spaghetti” tag and the OTC tag on his dorsal fin. After we released him, he came back to see what we were doing on the platform. Mako sharks will usually dive down deep once we release them from the cradle, but this little guy wanted to come back for one more look. One team of scientists set a swordfish line at 3am. We hauled in the swordfish longline at 6am. We caught one pelagic ray. We set the first shark line at around 8am, and hauled it in around 12pm. We caught one blue shark. We set the second shark line at around 2pm. We let it soak an extra hour, and hauled it in around 6pm. We caught one Blue shark, four mako sharks, and one pelagic ray. I had an opportunity to take a tour of the engine room with 1st Engineer Chris Danals. We first visited the aft work room. Chris is crafting a wooden boat by hand! It is very neat looking. He said that he builds boats for fun. He showed me the rudder room, and it’s amazing to see how huge these two rudders are. They control the rudder from the Bridge. In front of the aft work room is the engine room, which you have to climb down a ladder to get into. The noise is so loud that it is deafening, even with earplugs in. He explained that there are two main engines, which are White Superior engines. The port side engine is used to power the winch, which we use when we set/haul in the lines. The starboard engine is the one we use to power the ship. He said that the engines are diesel engines, and they get about 1 mile to the gallon. Chris also explained that even though the computers monitor everything in the engine room, they still have to monitor all of the engines in person during each watch. The engines are huge, each one being at least 6 feet tall and at least 15 feet long. But, as Chris explained, it takes a lot of power to move a ship this large through the water! The ship’s top cruising speed is 10 knots, but he said we often travel only a few knots, especially when we are setting a line or hauling a line. And, there are times when we are not moving but a few feet per hour, while the longlines are soaking. Another thing that Chris explained was how the ship makes water. Since they can only bring a finite amount of water with them to sea, they have to rely on other methods to get fresh water once they are at sea. He said that they pump sea water in, then they use heat to separate the fresh water from the salt. The only problem is that sometimes we aren’t moving, and the engines need to be hot in order to make water. This morning we were kind of between 4 islands: Santa Cruz/Anacapa, Santa Barbara, and Catalina. I think we are headed west today. You can’t see land anymore, and the waves have become much more intense…several stomach dropping waves this morning and last night. It is very foggy today, and it is quite cool outside. It actually looks like it might rain. Everyone was a bit disappointed when our first two hauls yielded only 1 animal each. But, the last set was better, and everyone is looking forward to seeing if the blocks farther out might have better luck. The real treat today was a California sea lion (which has been named Eddie). He was following us after the last haul, eating the mackerel that we were discarding. Eddie followed us for about 15 minutes, he was quite happy and kept coming up to the surface to look at us and blow water out of his nose. He was so cute! Of course, since we had been having bad luck with the sets, I did not bring my cameras downstairs, so I missed getting a picture of the whole thing! I am hoping that “Eddie” will come back tomorrow! During the night, they had to sound the fog horn several times to alert other boats that we were in the area. I thought it was the general alarm at first, but then I realized that it was just fog. 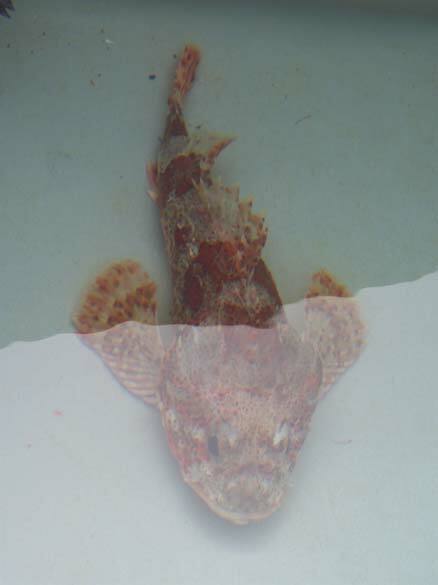 A Scorpion fish waits to have a DNA sample taken in the onboard tank. Dr. Russ Vetter caught the bottom-dwelling fish today and is doing research on Rockfish. There was no swordfish set done last night, so everyone got up at 6am to do the first of the shark sets for the day. We hauled in the first set at around 10am. We caught one mako. We set the second line at around 12pm. We hauled it in around 4pm. We caught 2 pelagic rays. We were just off the coast of Santa Cruz and Anacapa. It was such a beautiful sight to see! Anacapa is very rugged, with lots of canyons and steep drop offs. I don’t think my pictures will do it justice! A brown pelican decided to hang around today, so I got some good pictures of him. We tried to find him mackerel, but they were too big for him, and he just spit them back out. Everyone was a bit disappointed into today’s turnout. But, Dr. Suzy Kohin, the Chief Scientist said that this block was not a very good spot for them during the last leg either (they repeat the survey in 2 different legs so that they get a better sampling). We all hope that tomorrow we are able to catch more fish! Dr. Russ Vetter fished between sets. He caught several Rockfish, most of which were orange colored. He said that these were bottom fish, and he is doing an independent research study on them. He also caught a Halibut and a Scorpion fish. He took DNA samples from them, then they were prepared as part of the barbecue! Sean Suk caught a Sanddab this afternoon, but he threw it back in. There were lots of boats….sailboats and motor boats around us while we were near the port…they kept coming by to check us out. I’ve seen lots of big container ships while we’ve been in this area, as well. We went past an offshore oil rig this afternoon, and it was interesting to see just how close it is to the coastline of California! I have seen oil rigs in Wyoming, but the offshore ones are very different. It was neat to be able to see one in person. The exciting thing about today was that we had a barbecue on the aft deck. We had kabobs and burgers. It was great! The weather was gorgeous, and everyone laughed and a nice time. The crew said that they have a barbecue almost every Sunday and that it is kind of like a tradition. We went to Channel Islands Harbor near Port Hueneme, CA. They had to pick up some gear for the engineers at the port there. The weather became a bit cool after the sun went down…and I think I will have to close the door to my stateroom because it will probably be too chilly! We enjoyed watching the sunset, and we are all looking forward to another week together. After it got dark, we went down to the bow observation chamber, which is way down in the belly of the bow, below sea level. You have to climb down through 2 locks and down about 30 stairs, straight down. It’s kind of scary down there. There are 4 portholes which look out from the bow of the ship, and we could see the phosphorescent critters in the water. They glow green. It was very surreal. Jason Larese, Stephanie Snyder, Daniele Adrizzone, and I went down, then Ryan Harris joined us about half way through. Climbing up was not as scary as going down was! I made it out safely, but unfortunately, I couldn’t get anything to show up in pictures.